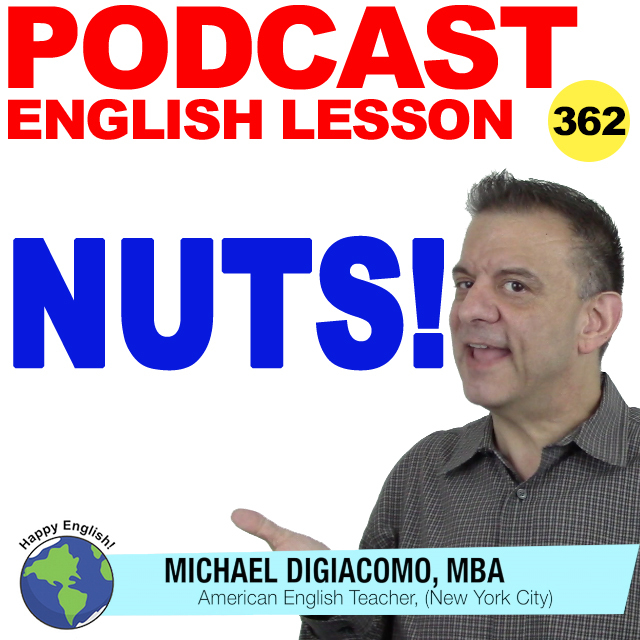 In English, we have some interesting ways to use the word nut. For today’s English lesson, let’s have a look at some different ways we use this little noun. My friend Teddy is nuts about Jane. Jenny is nuts about Johnny Depp. She has his posters all over her walls. Getting a new customer to sign a contract was a tough nut to crack. Keeping the surprise birthday party from Ted was a tough nut to crack. Jack said he’s planning on going skydiving this weekend. He’s nuts. My sister said I was nuts for working seven days a week but I enjoy my job. You’re going to go drinking until 5 AM and then go to work the next day? You’re a nut! A baseball nut is a big fan of baseball. A soccer nut is a big fan of soccer. My sister is a b.